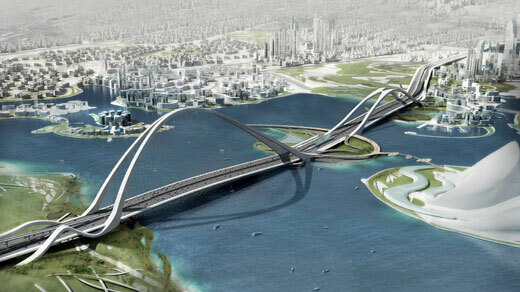 Scheduled to finish in the next 4 years, the world’s largest arch bridge will expand one mile long and 670 feet tall in Dubai. 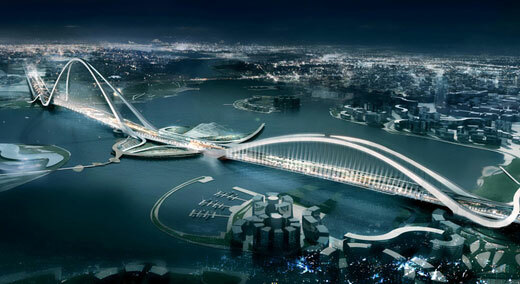 The bridged designed by New York based architecture consultant, Fxfowle. – It will have 12 lanes for traffic. – It will cost 817 million dollars. – The design has Sheikh Mohammed’s official stamp of approval. – The bridge will carry more than 2,000 vehicles per hour in each direction. – A metro line will run across the middle. – Construction begins in March, with a slated completion date of 2012.